Past Versailles FFA members who were elected into the Hall of Fame included (l-r) Danielle Hesson, Taylor Tyo (represented by Taran Tyo), Clair Schmitmeyer, Kayla Bruns, Mikayla Berger and absent Maggie Hedrick. 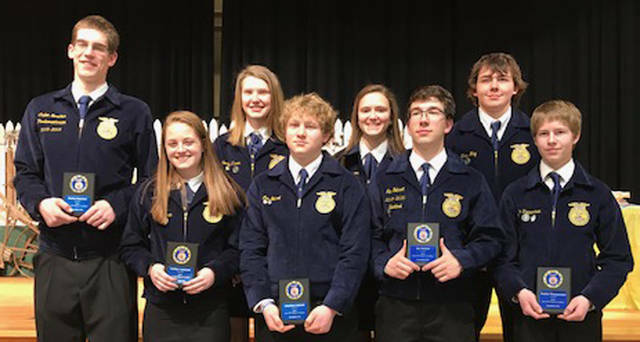 Versailles FFA proficiency award winners included (back row, l-r) Kennedy Hughes, Emma George, Alex Kaiser, Jacob Wuebker, (front row, l-r) Breanna Neiport, Noah Barga, Ian Gehret and Cole Luthman. Newly elected officers included (back row, l-r) Alex Kaiser as student adviser, Caden Buschur as vice president, Noah Barga as treasurer, Luke Billenstein as parliamentarian, Ian Gehret as sentinel, (front row, l-r) Deanna Hesson as president, Cayla Batten as secretary, Tori Wuebker as reporter and Laura Wuebker as historian. State FFA Degree recipients included (back row, l-r) Kimberly Winner, Deanna Hesson, Troy May, (front row, l-r) Caden Buschur, Caitlyn Luthman, Jon Gehret, Isaac Gehret and Austin Timmerman. Versailles FFA Star Senior Award recipients included (back row, l-r) Ben Albers, Marcus Berger, Jacob Wuebker, Grace McEldowney, Colleen Gehret, (front row, l-r) Courtney Batten, Cole Luthman, Dallas Hess and Toby George. Versailles FFA Star Greenhands included (back row) Lexie DeMange, (front row, l-r) Asa DeMange, Emily Delzeith and absent from the photo Paige Gasson. 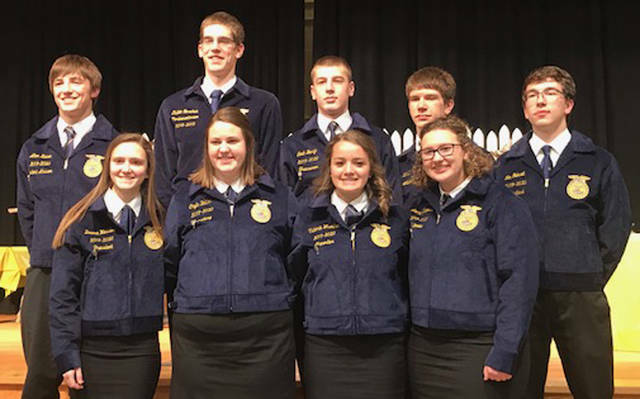 Versailles FFA newly elected officers include (back row, l-r) Alex Kaiser, student adviser; Caden Buschur, vice president; Noah Barga, treasurer; Luke Billenstein, parliamentarian; (front row, l-r) Deanna Hesson, president; Cayla Batten secretary; Victoria Wuebker, reporter; and Laura Wuebker, historian. Versailles FFA Honorary Degree recipients included (l-r) Mary Hartke, Steve and Linda Berger, Ryan Langenkamp, Hollie Ahrens and absent Mary Bergman. VERSAILLES – The Versailles FFA Chapter held its 84th annual FFA Parent-Member Banquet on March 11 at the Versailles High School. The banquet room was packed with more than 480 members, parents and guests. Everyone present enjoyed a catered dinner by Mary Bergman and her staff, followed by an evening of awards highlighting the accomplishments of the Versailles FFA over the past year. 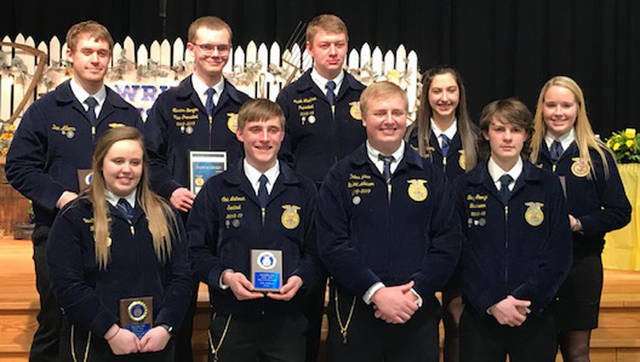 Among the list of awards were Honorary FFA Degree recipients, Chapter Awards, the induction of the 2019-20 Versailles FFA Officer Team and much more. The 2019 banquet was dedicated to the late Trevor Huber. A few of Huber’s friends spoke on his behalf and a slideshow with his involvement in FFA activities was presented, along with gifts for his parents. One order of business was to recognize the Capstone students and their employers. This past year juniors and seniors were allowed to participate in the Capstone program in which they leave school for the second half of the day to go to work. The students’ employers were awarded a plaque with the name of the Capstone employee with room to add more, and the plaques were sponsored by the Versailles FFA Alumni. The senior Capstone employees and employers include Cole Luthman, employed at Knapke Farms; Kole Litten, employed at Bob Drees Construction; Carter May and Toby George, employed by Knapke Kitchen and Baths LLC; Jacob Wuebker, employed at Wuebker Farms LLC; Gavin Lawrence, Derek Cavin and Kyle Pothast, employed by Francis Manufacturing; Derek Cavin and Kyle Pothast, employed by Pothast Construction; Deanna Hesson and Dallas Hess, employed by Greenville Ace Hardware; Luke Mangen, employed by Winner Meats; Jake Poling and Garrett Toops, employed by North Star Plumbing and Heating; Zach Schlater, Cole Prenger and Evan Keller, employed by Gary Smith Pallets and Poultry; Dylan Johnson and Jarrett Goubeaux, employed by Voisard Specialties; and Levi Hemmelgarn, employed by Siefring Dairy Farm. The junior FFA members and their Capstone employers include Jack Barga, employed by Barga Construction LLC; Jon Gehret, employed by A.L. Smith Trucking; Austin Timmerman, employed by SISCO; Troy May, employed by Indian Stone Holsteins; Lewis Winner, employed by Ross Medford Poultry Farm; Isaac Gilmore, Sam Gilmore and Chad Shimp, employed by Stateline Power Corp.; Chad Shimp, employed by Western Asphalt; Logan Winner, employed by D.L. Winner Livestock Express; Laney Petitjean, employed by Brilliant Beginnings; and Sara Mincer, employed by Versailles Health Care Center. People and businesses were rewarded with an FFA Honorary Degree for their outstanding services and contributions to the chapter, which included 4 Star Vet Practice Chickasaw, Dr. Bill Minton and Dr. Bethany Heitkamp; Hollie Ahrens; Mary Bergman; Linda and Steve Berger; and Ryan Langenkamp. Former members inducted into the Hall of Fame included Taylor Tyo, Andrew Harshbarger, Kayla Bruns, Makayla Berger, Maggie Hedrick and Danielle Hesson. 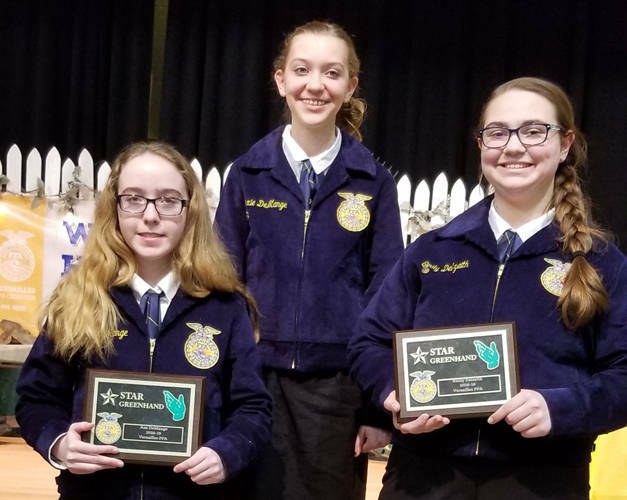 The FFA also recognized its proficiency winners who completed a 25-plus page application that was submitted to the regional and state evaluations. Plaques were sponsored by Phelan Insurance. Versailles FFA proficiency winners included Shelbie Schmitmeyer, who placed first in state dairy placement proficiency award; Toby George, who placed first in diversified livestock in state and later was recognized as a top four national FFA finalist; Jacob Wuebker, who placed first in state swine placement proficiency award and was later recognized as a top four national FFA finalist; Aaron Knapke, who placed first in poultry production in state and later was recognized as a top four national FFA finalist; Jamie Hart, who placed first in the state AG communications proficiency award and later was recognized as the National FFA winner AG communications proficiency award winner; Noah Barga, who placed first in District 5 in goat production; Kennedy Hughes, who was the diversified vegetable production award winner; Alex Kaiser, who was the environmental and natural resources award winner; Emma George and Breanna Nieport, who were the vegetable production winners; and Ian Gehret, who was the chapter beef placement proficiency award winner. Having good record books is a key part of the SAE. At the banquet, the Versailles FFA recognized those individuals with outstanding record books. Outstanding record book winners included – eighth grade class: Luke Winner, Gabe Marchal and Isaiah Hess; freshmen class: Elise George, Zach Watren, Wesley Gehret and Carter Luthman; sophomore class: Madison Henry, Darian Feltz, Gage Holmes and Victoria Wuebker; junior class: Dylan Myer, Trent Langenkamp and Isaac Grilliot; and senior class: Gavin Lawrence, Melissa Gigandet, Katelyn Knapke and Shelbie Schmitmeyer. High scholastic is an important part of each high school student’s life. The Versailles FFA Chapter recognized those students from each class who excelled in academics in all high school classes. Outstanding scholarship winners included – eighth grade class: Emily Delzeith and Asa DeMange; freshman class: Dalton Hesson, Caleb Kaiser and Delaney Barga; sophomore class: Cayla Batten, Luke Billenstein and Kennedy Hughes; junior class: Emma Peters and Bradley Didier; and senior class: Courtney Batten. The fruit selling winners were: top selling family, Jacob and Laura Wuebker; second place family, May and George Family; and third place family, Dalton and Deanna Hesson. The top selling individual was Owen Gehret; second place individual was Darian Felts and third place individual was Nicholas Didier. The 2018 State FFA Degree candidates were recognized including Troy May, Austin Timmerman, Deanna Hesson, Caden Buschur, Ian Gehret, Jon Gehret, Caitlyn Luthman and Kimberly Winner. The 2018 American Degree candidates were recognized including Sarah Gigandet, David Barlage, Jaime Hart, Isaac Gehret and Sean Besecker. The chapter also gave recognition to members who assisted with all types of activities during their study hall including Gage Holmes, Elliot George, Xavier Grilliot, Shiloh Hess, Luke Billenstein and Franklin Shimp. The highlight of the awards program was the announcement of the top awards – 2019 eighth grade Class Star Greenhands: Emily Dezeith and Asa DeMange; 2019 freshman class Star Greenhand Alexa DeMange and 2019 sophomore class Star Greenhand Paige Gasson. Also, a highlight of the awards program was the presentation of senior awards by Matt Aultman of the Darke County Farm Bureau including the 2019 Star in Ag Placement, Jacob Wuebker; 2019 FFA Ideas Unlimited Award Cole Luthman and Grace McEldowney; 2019 FFA Achievement Award, Courtney Batten, Dallas Hess, Ben Albers and Toby George; and 2019 Leadership Award, Marcus Berger. As part of the evening, Versailles FFA conducted an auction with Bill Roll as the auctioneer to benefit the Versailles FFA Chapter and FFA Alumni. The items donated were decorated cakes, farming picture, wooden decoration with quote, homemade baked goods, FFA tractors-Farmall and International, Yeti package, Holstein calf, meat and cheese basket, wooden farm scene though saw carvings, John Deere quilt blanket, metal Versailles Tiger football wall hanging, pedal tractor, farming/deer picture, fruit basket, Batdorff Red Barn Catering-boneless pork loin, Mary Kay products, handcrafted sewing items and cookies, bag of milk replacer, wood sign decoration and cookies, home sign and Norwayne spruce tree. Donations came from Steve and Linda Berger, Jeff and Dena Wuebker, Greg and Holli George, Suzanne Batten, Randy and Danielle Luthman, Marcus and Rosana Hess, Steve and Jill McEldowney, Doug and Sherry Hesson, Steve and Vicki Buschur, Marilyn Wyler, Versailles Poultry Days Committee, Kirk and Marge Harman of Stateline Power Corp., Stateline Power Corp., North Star Hardware and Implement, Jon and Julie Bergman, Melvin and Mary Ann Stucke, Dan and Tawni Batdorf, Curt and Monica Goubeaux, Paul and Angie Mangen, Otto and Laura Schwieterman, Daniel Schrader, Toney and Anita Knapke, Brittany Harman’s MD class, Jill and Gary Gehret, and Bob, Patty and Wesley Gehret. Individuals and businesses who purchased items included Versailles FFA Alumni, Ross Medford Farms, Versailles Feed Mill, Greenville Ace Hardware, Ken and Mary Hartke, Bohman Trucking, Hess Fencing, Jeff and Dena Wuebker, Bruns Animal Clinic, Ted Schmitmeyer-Line View Holsteins, Mark and Mary Ann Stucke, Versailles Policy, Steve and Linda Berger, Fort Loramie Hardware, Frenchtown Trailer Sales, Weaver Eggs, Billenstein Swine Farm and JoAnn Pfieffer. There also were several scholarships awarded with the help of the Versailles FFA alumni. Tessa Tyo and Isaac Gehret, who are all majoring in agriculture, each received a $250 book scholarship from the alumni. The next scholarship given was in memory of Doug and Craig Meier, given to students that will enter activities related to production agriculture after graduation. Jacob Wuebker and Shelbie Schmitmeyer received this scholarship and were rewarded with a $750. The FFA Alumni also awarded a scholarship in memory of Lester and Marlene Ward. This $2,000 scholarship was given to Shelbie Schmitmeyer, who is majoring in agriculture with future plans of returning to the family farm.